The Unilock preset gem system is a patented seamless bezel setting with a barrel shaped tube. 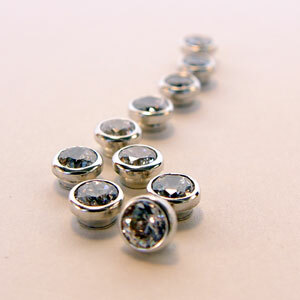 This setting was born out of the necessity to apply a gem over any metal without the use of solder or adhesives. There are many points of difference that make the Unilock unique to any other setting in the market. This setting allows you the unlimited possibility of placing any round stone flush or above any solid or thin-walled material by a press-fit action. The Unilock is user-friendly and only requires a surface hole to be inserted. This latest preset technique gives manufacturers and retailers the ability to “personalize” any product, any time, from jewelry to fashion in an instant. 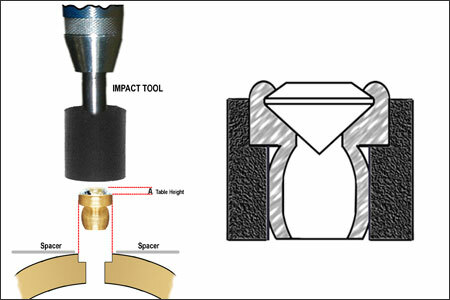 The drilling of the housing where the Unilock is to be inserted is performed by a two-step carbide drill as per the size of each individual Unilock model. Varying the depth of the hole will allow the Unilock to sit flush, on the surface, or sit above the surface. The durability and versatility of the Unilock is due directly from the unique engineering quality of the barrel shaped body of the setting. This barrel shape when press-fit into an item by an impact tool will automatically want to spring back into its original form allowing it to lock itself into place. During the R&D process we discovered the natural ability of metal wanting to take its original form called “metal memory”. The Unilock is seamless and the barrel shape exercises a uniform holding pressure all around the inside of the wall of the hole. 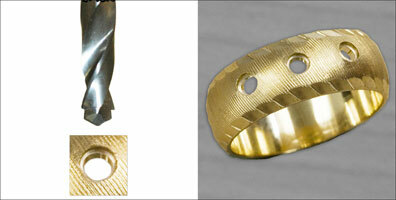 The Unilock with its press-fit action is the ultimate, most advanced application system to set gems.